HospiCarePro was designed to improve the quality and management of clinical care and hospital health care management in the areas of clinical process analysis and activity-based costing. Improved patient care, cost control, aid in decision taking and security are sure benefits of implementing this innovation. Properly implemented, HospiCarePro can improve quality of patient care by increasing the timeliness and accuracy of records and administrative information. HospiCarePro provides simplified access to patient records and other administrative information for those who need it. It also sets a standard for patient care, making it more consistent across the board. In many cases, patients can also use the system to better educate themselves about their diseases and conditions as well as treatments and outcomes. The increased standardization of HospiCarePro improves cost control by improving efficiency and productivity. Personnel costs and inventory levels can be reduced through the avoidance of duplications and repetitions. HospiCarePro can also help eliminate confusion and delays that are caused by incomplete or missing records. These systems provide a managerial tool for decision making because they offer the functionality of assembling various types of data into usable reports. Data can be collected and categorized so that managers can analyze such information as patient lists, bed occupancy rates and statistics categorized by doctors. HospiCarePro is a secured application with databases of administrative and patient information that can be easily accessed only by those who need the information. 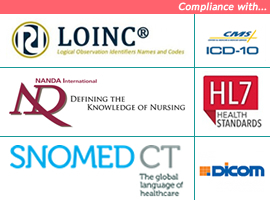 HospiCarePro links departments without compromising the security of the information involved. The fact has been highlighted and reinforced by experts that hospitals that rely on the manual system are more vulnerable to data theft and leakage than automated ones. HospiCarePro is a full-fledged e-health system that keeps every bit of information secure from unauthorized access. When everything is handled by an access-controlled system where availability of information depends on user rights, there is no possibility of error. It is the reason health clinics, hospitals, trauma centers, rehabilitation centers and nursing homes are installing high-quality management systems. A hospital or medical center serves humanity, but profitability is an equally important aspect because it is a business also. Revenue management is a key element because it requires a fortune to run a hospital and. It is impossible to track the same using age-old manual systems. Automated hospital management system that is tailored as per the business requirements can solve the purpose effectively and that is exactly why you need HospiCarePro! It offers fast and accurate transactional and management reports that give an instant feel of how the business is doing. What are the outstanding amount, pending invoices, and debts and interests? As stated earlier, managing hospital is a crucial thing where there is no scope for errors. A manual system can’t assure foolproof and 100% accurate processing. There are possibilities of errors and mistakes. Deploying HospiCarePro removes the chance of error completely, and you avoid compliance issues and lawsuits, the two biggest hassles for medical centers and hospitals. Thus, in spite of high investment it is a good deal. In addition to it, tracking a minute detail of room occupancy, staff availability, and operational information is available at the fingertips. HospiCarePro makes sure that operational and clinical decision-making process is fast, accurate, and efficient. With an easy, single view availability of data points, doctors, and medical support staff gets facilitated. When a hospital is managed by new-age hospital management system, it gets established as a techno-savvy and modern medical center. It is highly important in the fiercely competitive modern world that your hospital has a good reputation. Today, people rely on computerized systems more than manual ones. It creates a high level of trust in the systems and processes. Also, it is possible to maintain connectivity with patients and peripheral systems if the operations are managed using HospiCarePro. With the advancement of Information Technology in last few years, there has been a revolutionary change in the automation and management systems available for hospitals. Other than handling mundane operational stuff by business automation modules, they offer intelligent Management Information System as well. An error-free and well-organized module is need of the day. HospiCarePro is one outstanding one! HospiCarePro is capable of providing a better concerted environment between hospital staff, doctors, groups, patients and managing workflows. HospiCarePro even have the ability to unify legacy applications, objects from other portals, and handle multitudes of user requests resulting in an uninhibited flow of information between staffs, doctors, patient and externally connected partners. Other supporting devices/peripherals are not listed here.